Barnes Memorial Funeral Home Ltd. Provide comfort for the family of Isabell Dart with a meaningful gesture of sympathy. 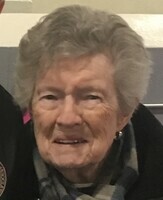 Passed away at Lakeridge Health Oshawa on Friday March 22nd, 2019 at the age of 96. Dearly loved wife of the late Howard Dart (1992). Much loved mother of Lynn Jury (late William) of Oshawa. Predeceased by her son Larry Dart and survived by daughter-in-law Geri of Peterborough. Grandmother of Kelly (Matthew), Blair (Shannon), Lisa (Rick) and Chris (Charli). Great grandmother of Shawn, James, Kailey, Kaitlyn, Lucas, Harrison and Harper. Special Aunt of Sandy, Dale and Lori. Predeceased by her brother Douglas Robertson (late Millie) and her sister Jean Thrush (late Charles). In memory of Isabell memorial donations to the Cancer Society would be appreciated by the family. Private family services have taken place, arrangements entrusted to Barnes Memorial Funeral Home, 5295 Thickson Rd. N. Whitby. Donations are being accepted for: CANADIAN CANCER SOCIETY - SOCIÉTÉ CANADIENNE DU CANCER (CANADIAN CANCER SOCIETY - SOCIETE CANADIENNE DU CANCER). We encourage you to share your most beloved memories of Isabell here, so that the family and other loved ones can always see it. You can upload cherished photographs, or share your favorite stories, and can even comment on those shared by others. Dear Lynn and family, I'm so sorry to hear of the passing of your sweet Mom. I will always remember her smile and her gentle way . She was a woman with a soft heart and amazing inner strength! May she rest in eternal peace and may you all be comforted by the lifetime of precious memories she has left with you. Proudly Serving the Communities of Brooklin, Whitby, Oshawa, Ajax, Pickering, Port Perry, the surrounding communities.